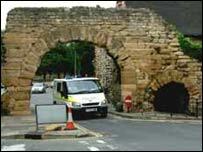 A Roman arch in Lincoln has been damaged by lorry - exactly 40 years after it was smashed by another lorry. Some stonework on the Roman Newport arch was chipped when a lorry drove into it on Wednesday. The arch once formed the fort's north gate and is believed to be the only Roman arch in the world under which vehicles are allowed to drive. The same arch was nearly destroyed 40 years ago when a lorry transporting fish crashed into it. A Lincoln city council spokesman said Wednesday's damage was far less serious, but still cause for concern.